Hooded youths torched a McDonald's restaurant and several vehicles after joining the traditional May 1 union-led demonstration for workers' rights. 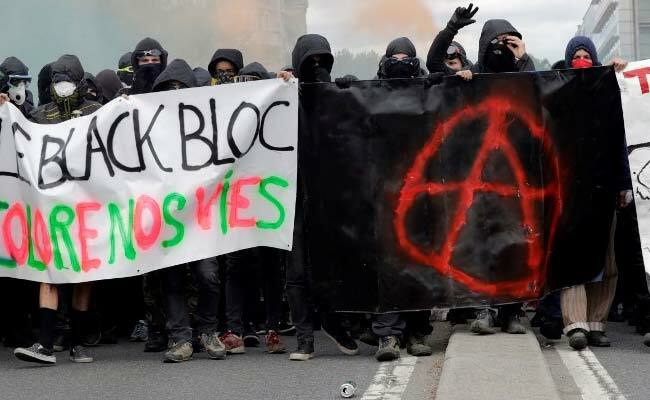 Paris, France: French police said 109 people were in custody on Wednesday after violent May Day protests in Paris, correcting an earlier figure of 209 given by Interior Minister Gerard Collomb. Collomb, who gave the wrong figure in a television interview, promised to boost policing at future protests after facing accusations that the government had been caught unaware by 1,200 trouble-makers. "For the next demonstrations there will be even more security forces, this time with the intention of totally separating protesters from those who have come to smash things up," he told France 2 television. President Emmanuel Macron, on a visit to Sydney, deplored the violence. "May 1 is Workers' Day, not the day of the hooligans," he told a press conference. "I can only condemn again what has happened, with the greatest firmness," he said. Shouting "Rise up, Paris" and "Everyone hates the police", anti-capitalist protesters in black jackets and face masks had tried to hold up the Paris march and then ran amok along the route. They set fire to a McDonald's restaurant near Austerlitz station, east of the city centre, and torched vehicles at a car dealership.